A hero who gave his life willingly to try and save others. Francis Bull Cokayne was born in Middlesex, the son of George and Jane Cokayne. His mother Jane Cokayne had run a pub on Canterbury Street which was right next door to the family home. The family had lived lived in Gillingham since Frances was nine. In 1900 Francis marred Caroline Deborah Gilkes and together they would have thirteen children. (note some of the articles state ten children but he had thirteen) The family had been residing at 44 Canterbury Street for the twenty seven years prior to the tragedy. Frances was extreamly well liked by the residents of Gillingham. He was employed as a journeyman painter and a decorator. His youngest daughter at 89 still resides in Gillingham. Francis was admitted to hospital at 10:35 pm the night of the fire suffering from burns to his face, neck, forearms and chest. He died at 7pm on the following day from shock. Fireman Cokayne was known for his bravery and courage. He was not trapped in the structure when it started to burn. Without a single thought to himself rushed inside to try and save the others. Francis was seen jumping from the burning structure with a young boy under each arm. His body was identified by his son Francis Henry Cokayne. Francis's coffin was carried to the cemetery on a fire engine. The procession would have started just around the corner from his home on Canterbury Street, passing right by his home on the way to the cemetery. 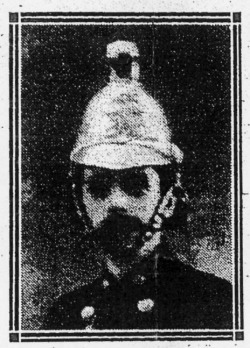 Fireman Cokayne was 52 years old at the time of his death. The Gillingham Fire Brigade 1924 with a trophy won at Gravesend in 1923. Fireman Francis Bull Cokayne is third from the right in the back row. This was a Christmas post card he sent to his brother Leonard Harwood Cokayne who was living in Cape Town. On the back of the card is his handwritten note to his brother, a poignant portrayal of his pride at being a fireman. Left - c1955 Four generations of Cockayne middle from left is Francis's widow Caroline and their daughter Jennie, at the back is their grandaughter Joan an in front is their great grandaughter Gillian. The right is a photo of Francis. Fireman Cokayne is in the first row on the far left hand side. All three firemen who perished in this tragedy are in this photo, Fireman Tabrett, Fireman Cokayne and Fireman Nicholls. His youngest daughter May, now 90 years old, has lived in the family home the whole of her life. She is our onluy living link to the man we never knew and the tragic events of 82 years ago.